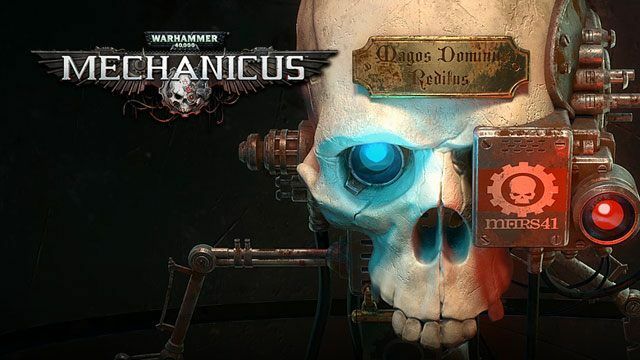 Gameplay-facilitating trainer for Warhammer 40,000: Mechanicus . This trainer may not necessarily work with your copy of the game. Available here: Warhammer 40K: Mechanicus Trainer. Numpad 1: Unlimited Movement - make sure you have moved a unit 1 space, then toggle this on, then you can move over and over. Numpad 2: Unlimited Cognition Points - make sure you have moved a unit 1 space, then toggle this on. Even with no points shown on the gauge, you have plenty. Numpad 3: Capture Unit Data - make sure you have moved a unit 1 space, then toggle this on to capture the units in the game for use with several options below. Numpad 4: Set Unit Health - use Capture Unit Data option, first, making sure it's on, the move a unit one space, then press this option to set the value to the value shown in the trainer. The value will reset to the max upon ending the turn. Remember, move the unit one space FIRST, then press the key, then when you move the unit again, the value is set. Numpad 5: Set Unit Ranged Defense - use Capture Unit Data option, first, making sure it's on, the move a unit one space, then press this option to set the value to the value shown in the trainer. The value will reset to the max upon ending the turn. Remember, move the unit one space FIRST, then press the key, then when you move the unit again, the value is set. Numpad 6: Set Unit Melee Defense - use Capture Unit Data option, first, making sure it's on, the move a unit one space, then press this option to set the value to the value shown in the trainer. The value will reset to the max upon ending the turn. Remember, move the unit one space FIRST, then press the key, then when you move the unit again, the value is set. Numpad 7: Super Units - use Capture Unit Data option, first, making sure it's on, the move a unit one space, then press this option to set the value to the value shown in the trainer. The value will reset to the max upon ending the turn. Remember, move the unit one space FIRST, then press the key, then when you move the unit again, the value is set. This basically gives you full health and 99 defense rating. Numpad 8: Unlimited Attacks/Skill Uses - make sure you have used an attack or a skill, then toggle this on, and you can use it again. Works best in tandem with Instant Cooldowns. Numpad 9: Instant Cooldowns - toggle this on and when you attack or use a skill, it won't require turns to reset. You may have to have attacked at least once for this option to work. Numpad 0: Capture Blackstone - enter the upgrades screen in the ship where you can use them, then toggle this on for using the option below. Numpad /: Set Blackstone - make sure to use Capture Blackstone first then press this to set it to the value shown in the trainer. Numpad *: Reset Mission Alarm - make sure you have moved one location in the current mission where the alarm is at the upper right, then toggle this on. For the remainder of the mission, the alarm value will remain at zero, which at the end of the mission will not add to the overall total.